I think4 it's rather a mistake to emphasize to the landscape—to me that suggests ornamental descriptive writing, which I hate. There really is a good deal of movement in this narrative5. In future announcements won't you, with Dr. Leach's6 approval, use something like the enclosed, putting the stress more on the people than the scene? Miss Cather's new narrative, Death Comes etc, recounts the adventures of two missionary priests in the old Southwest. Two hardy French priests find themselves set down in in the strange world7 at the end of the Santa Fé8 trail, among so scouts and trappers and cut-throats, old Mexican settlements and ancient Indian pueblos. The period is that immediately following the Mexican War, and the story is a rich, moving panorama of life of on that wild frontier. The year of the letter is established by Cather's reference to the forthcoming serialization of Death Comes for the Arcbishop in the Forum, which began in January 1927. 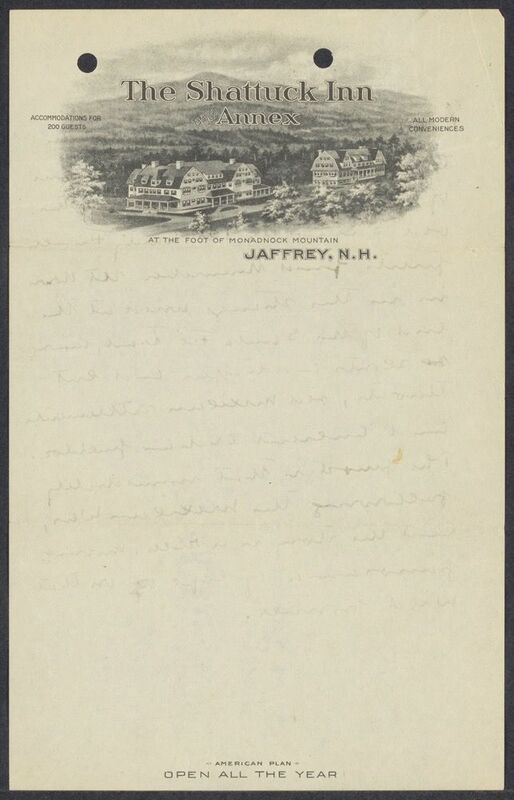 Shattuck Inn (Jaffrey, NH): Hotel built in 1910 in Jaffrey, N,H owned and operated by E. C. Shattuck until his death in February 1933, when operation was taken over by his daughter, Eleanor Shattuck Austermann, and her husband George Austermann. Cather stayed at the Shattuck Inn many times, often with Edith Lewis, finding it a useful place to work. 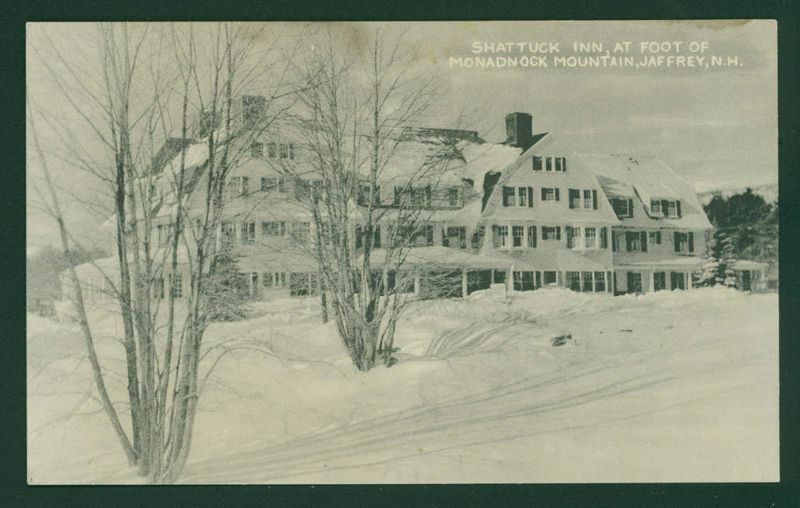 In 1947, Cather wrote of the Shattuck Inn: “I have never found any place where I could work in such peace and happiness as in the little rooms up in the top of the Shattuck Inn” (#1748). 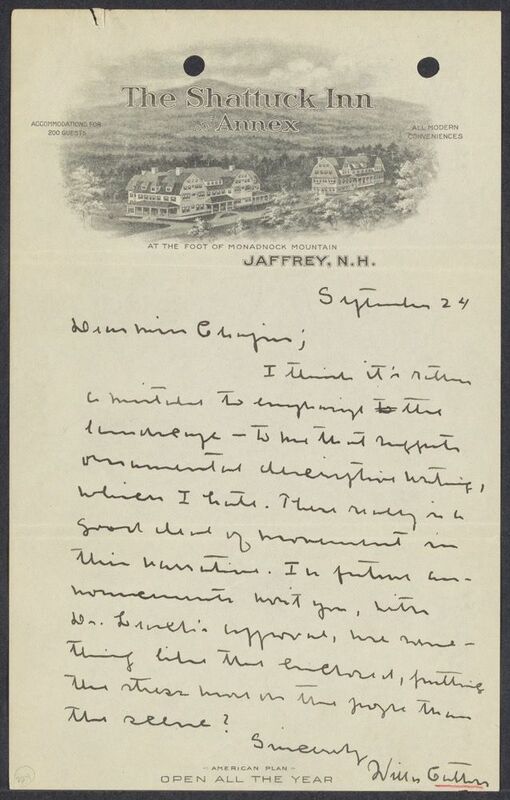 Cather is evidently responding to draft promotional copy for the serialization of Death Comes for the Archbishop in the Forum from January to June 1927. Larkin, Eunice Chapin (1896-1978). American magazine editor, novelist, and screenwriter. Born and raised in Lincoln, NE, Eunice Chapin graduated from the University of Nebraska in 1915 and received a fellowship for graduate study in French at Bryn Mawr College. She became a friend of Willa Cather’s sister Elsie Cather during her studies at the University of Nebraska. In New York City Chapin worked as associate editor of McCall’s Magazine and literary editor of the Forum. She corresponded with Cather about the serialization of Death Comes for the Archbishop (1927) and “Double Birthday” (1929) in the Forum. The success of her novel Pick Up (1931) led her to leave magazine work, move to Hollywood, CA, and become a screenwriter. She married fellow screenwriter John Francis Larkin in 1932. They frequently visited Lincoln with their twin daughters, Bourke and Morgan, and are buried in Wyuka Cemetery in Lincoln. Leach, Henry Goddard (1880-1970). American author, educator, and editor. Leach (Princeton University B.A. 1903, Harvard University Ph.D. 1908) was a leading authority on Scandinavian literature. He served as editor of The Forum from 1923 to 1940 and president of the American-Scandinavian Foundation from 1926 to 1947. The Forum serialized Cather’s Death Comes for the Archbishop (1927) and published “Double Birthday” (1929) in two parts. When Granville Hicks used a review of Shadows on the Rock (1931) in the Forum to launch what Cather perceived as an attack on her personally, she was aggrieved but accepted Leach’s apparent apology. 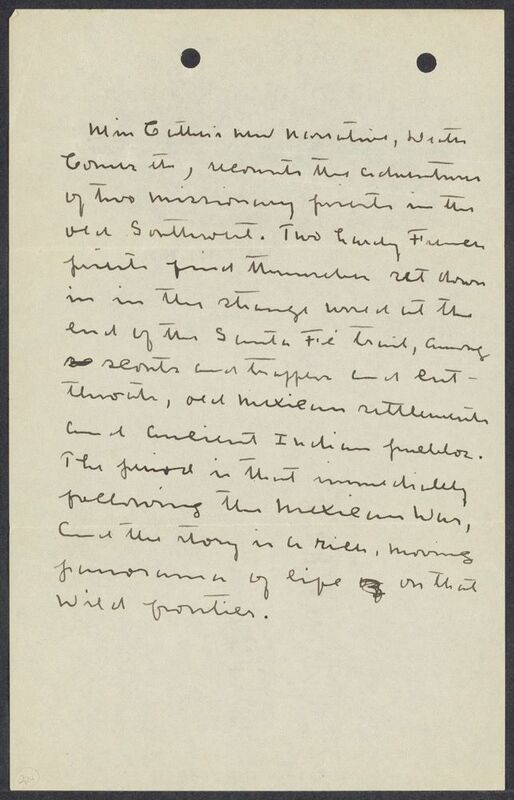 It is not clear when Cather and Leach first met, and their extant correspondence relates exclusively to his work as editor of the Forum. However, in the 1940s she called him an “old friend” and apparently saw him socially in New York City (#2191).